A circle with centre O in which AB subtends ∠AOB at centre and angle ∠ACB at any point on the remaining part of the circle. Construction: Join CO and produce CO to point D .
1. In ∆AOC, OC = OA || Radii of same circle . 3. 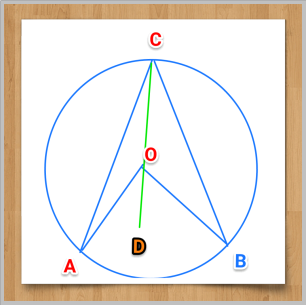 Exterior ∠ AOD = ∠OCA+ ∠OAC || Exterior ∠ of a ∆ = sum of two opposite interior angles.